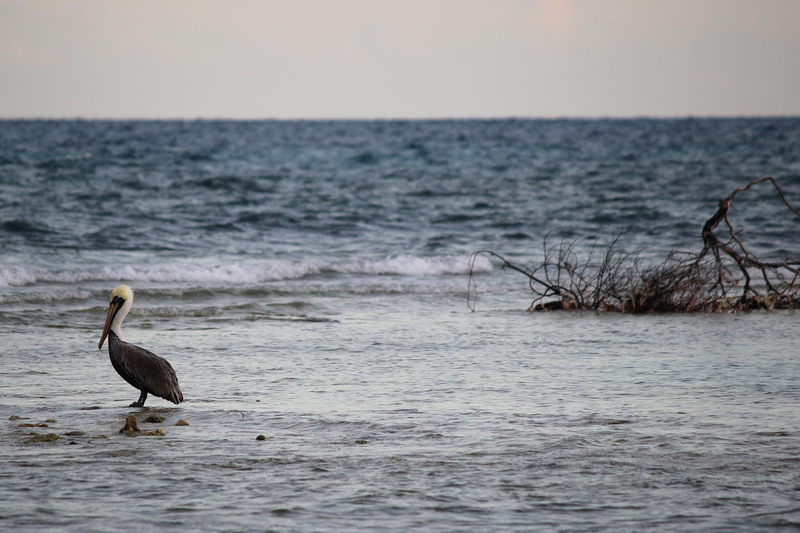 As late afternoon arrived on Garden Key on November 14, 2016, the vast majority of the island’s inhabitants outside of Fort Jefferson were lounging and relaxing. 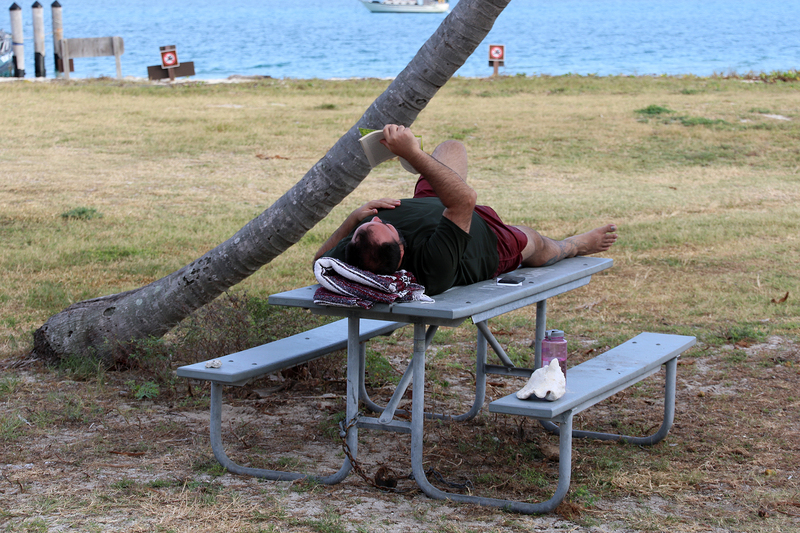 Juan had discovered a picnic table that became his chaise while we were at Dry Tortugas. Noah had brought along one of those big inflatable sofa things. 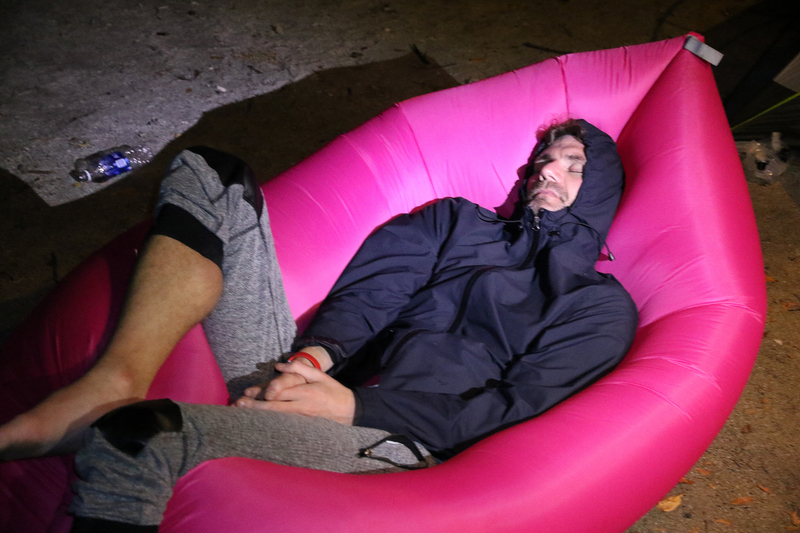 Sean was dozing in our tent. Still unable to sit still, I proposed we take a walk out onto Bush Key. Sean and the Detroiters agreed, and we set out just before 5pm. 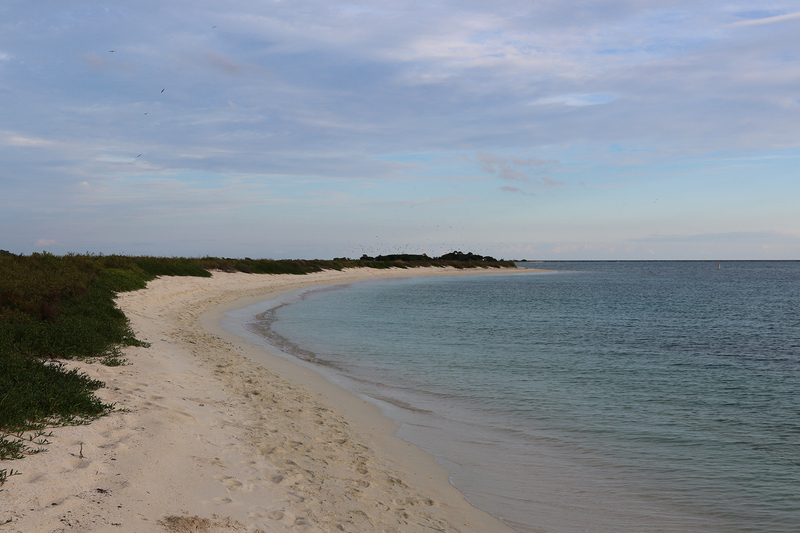 Bush Key is oriented east/west immediately to the east of Garden Key. 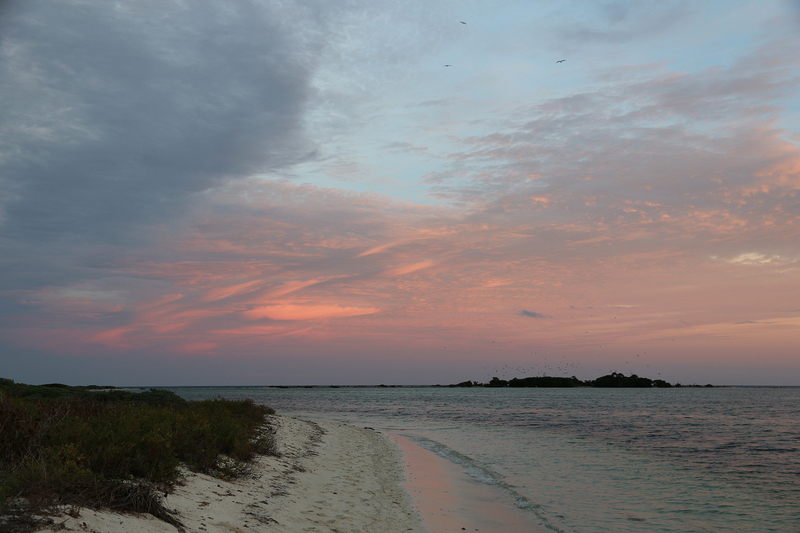 Bush Key is 500 feet wide and 3,000 feet long and is less than three feet high. 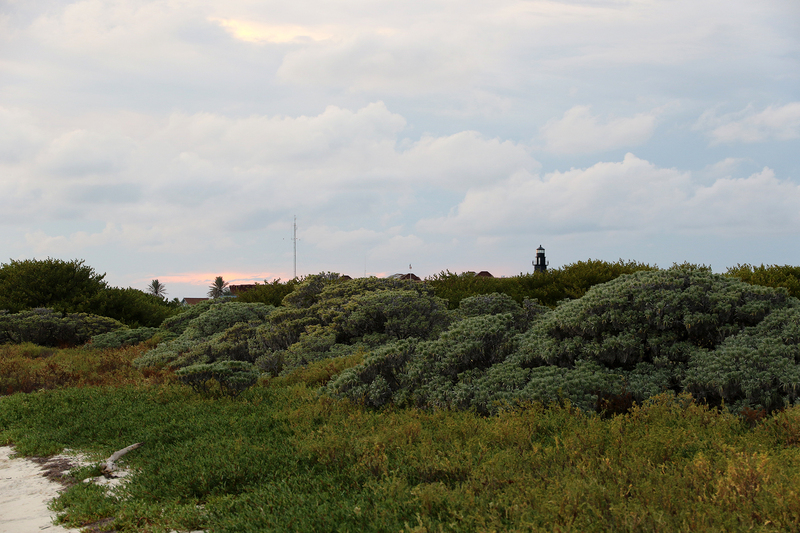 It is covered by tropical shoreline scrub. 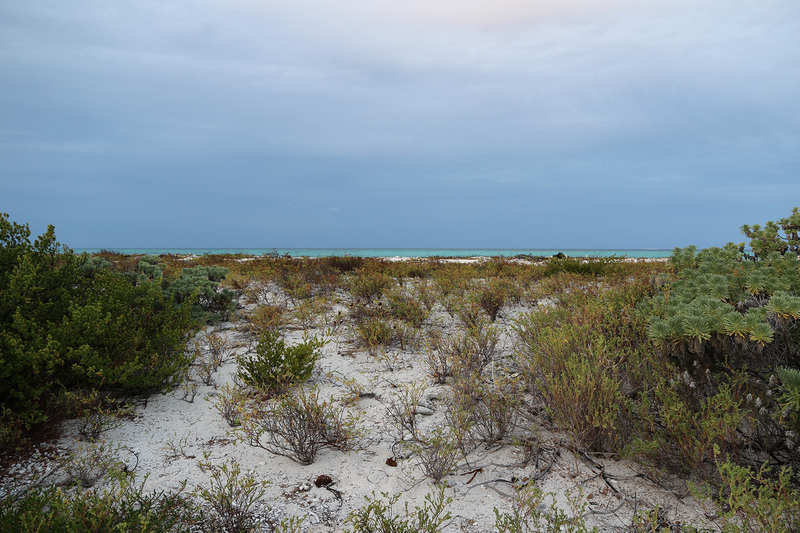 While we were at Dry Tortugas, Garden and Bush Keys were connected by a substantial sandbar. 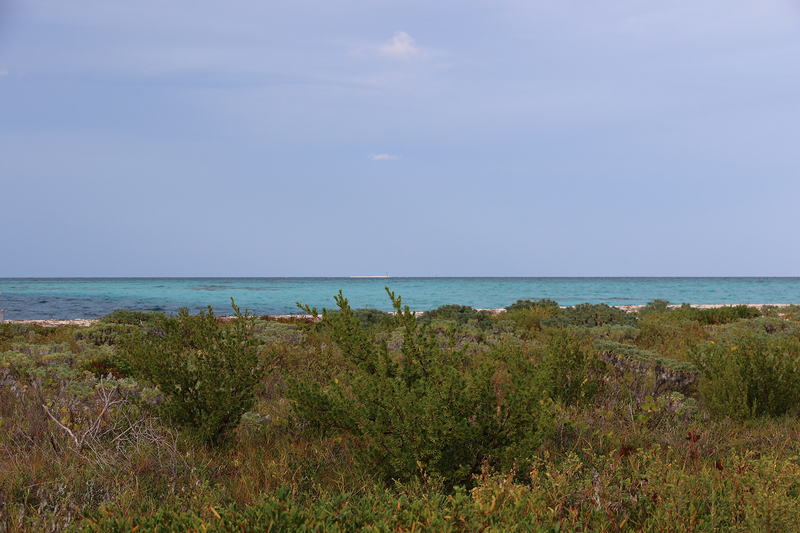 We walked along Bush Key’s tranquil southern shore, where Garden, Bush, and Long Keys create almost a calm, three-sided lagoon. 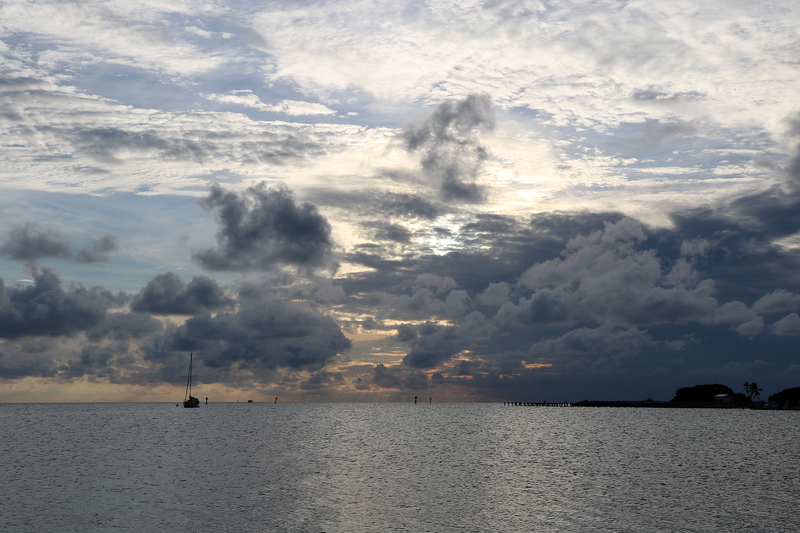 The dark skies, rendered in sharper contrast by the setting sun, still had not actually reached us at Garden Key. 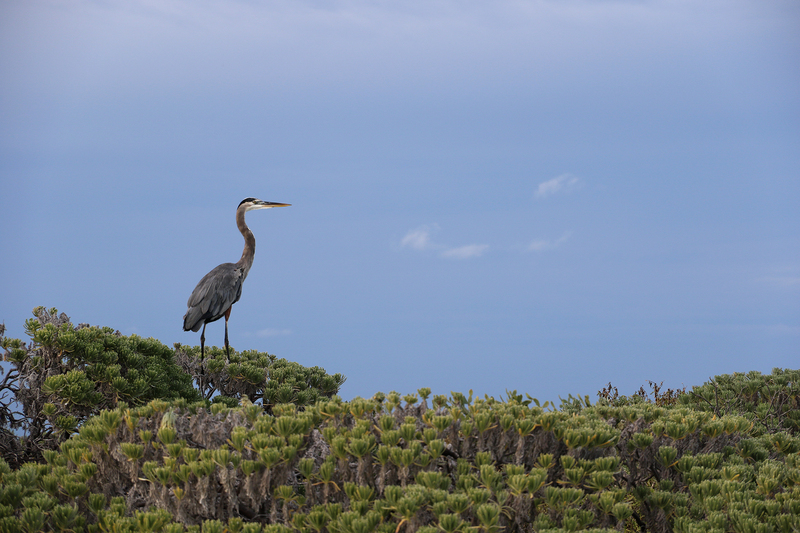 We came upon a Great Blue Heron hunting along the beach. 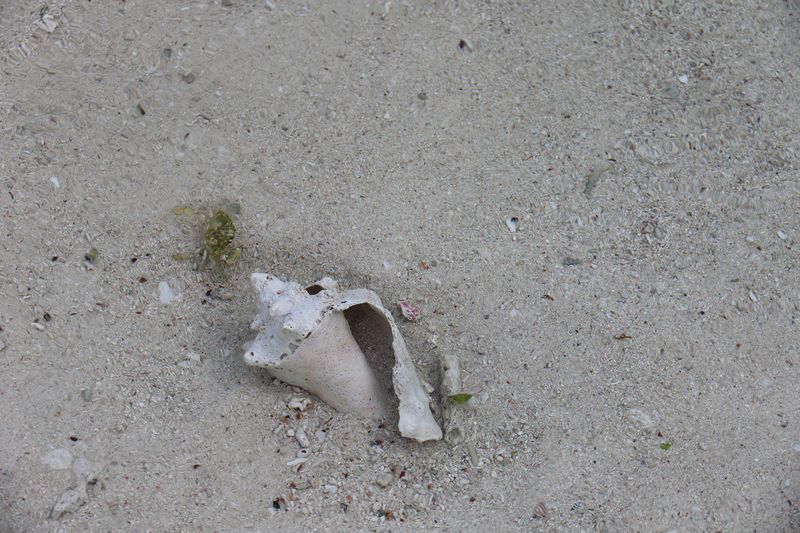 Common in the United States from Miami to Juneau, they are uncommon at Dry Tortugas, and this one was all alone. 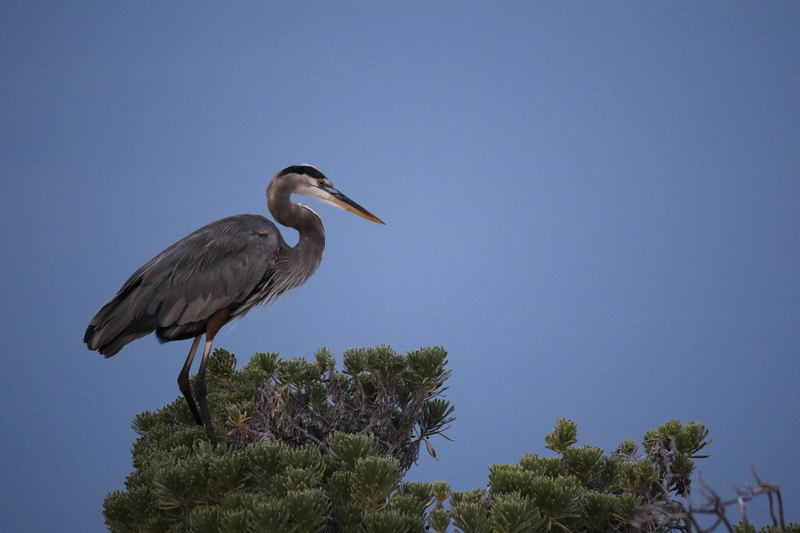 We would see this heron again and again over the following days. 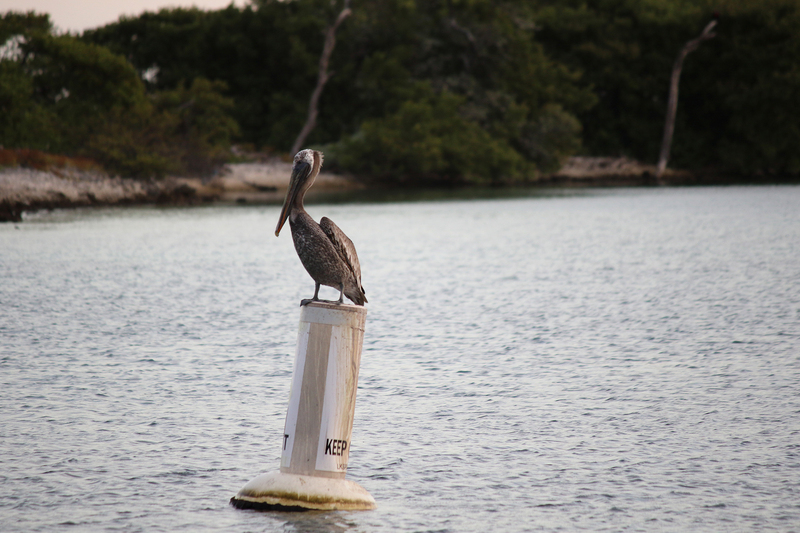 It was like it was our host at Dry Tortugas. 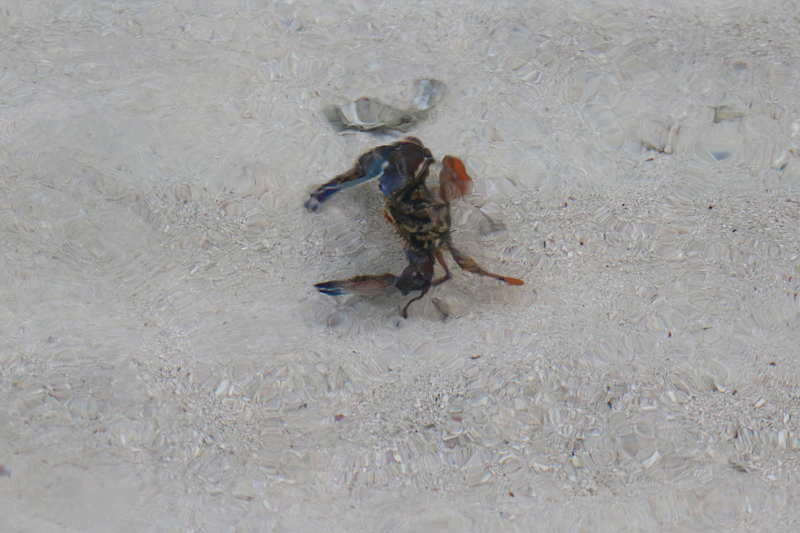 As we walked slowly along, we spooked him enough to fly away and land in the scrub while we passed. 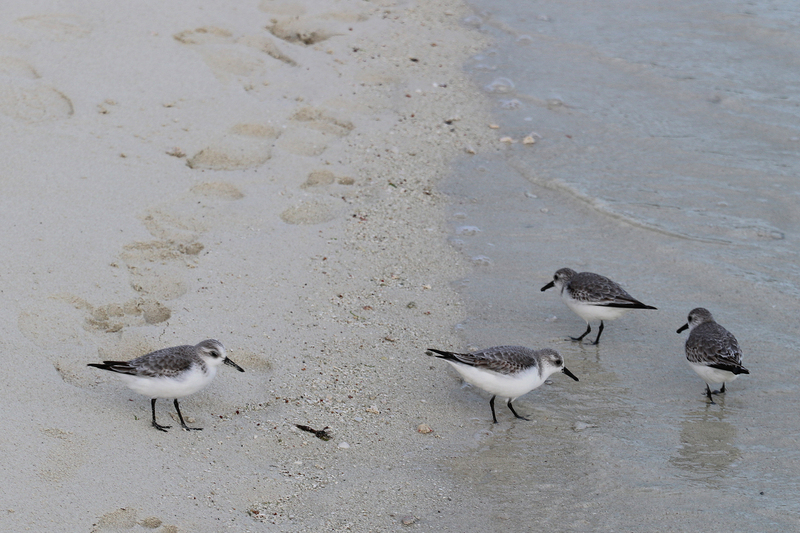 On the other end of the size scale for birds, we also came upon a troop of Sanderlings, tiny sandpipers hurrying along and peeping, looking for insects for their supper. 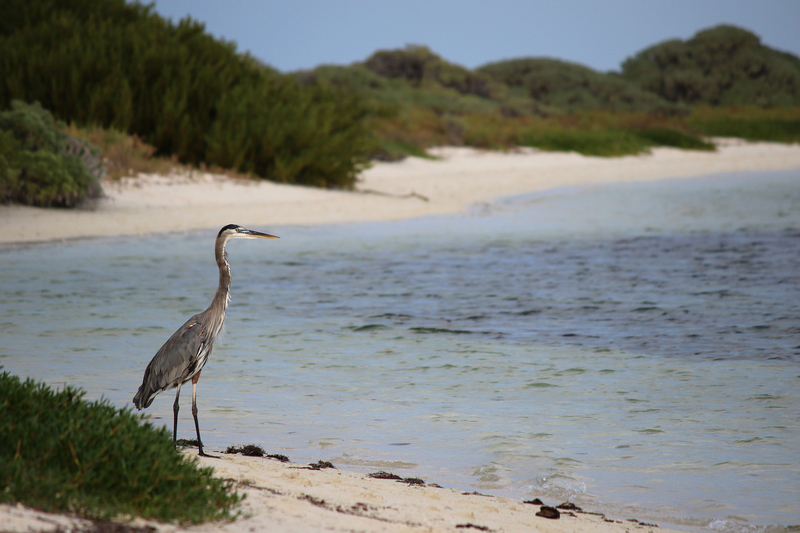 These little birds would spend their winter here at Dry Tortugas, but they spend their summers in the Arctic. 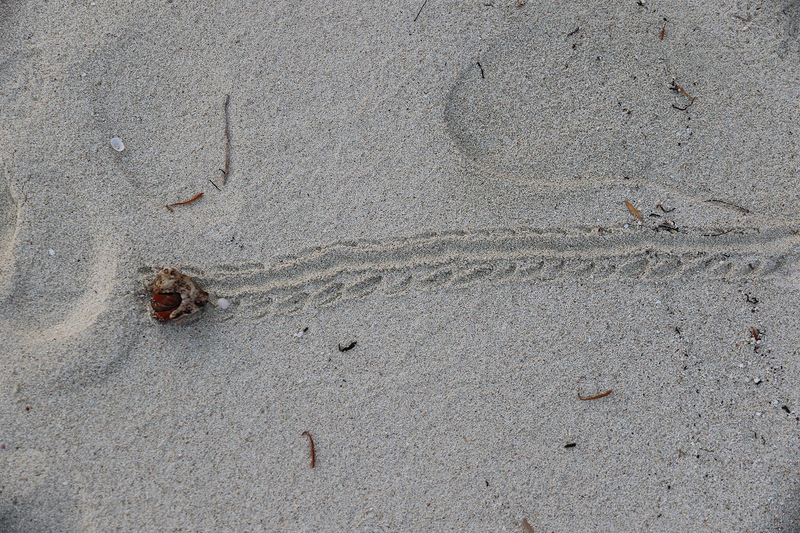 For a while, they seemed to be leading me along, and we joked that I was now commander of a Sanderling army. 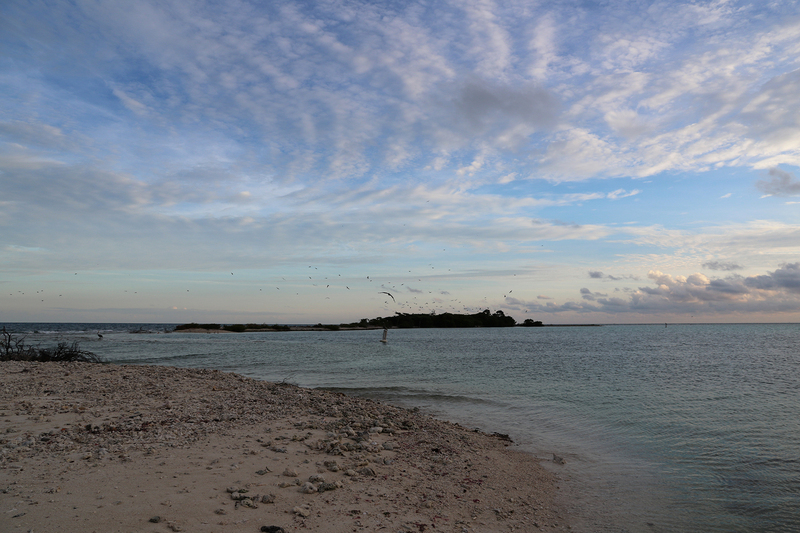 As we neared the end of Bush Key, we got better views of Long Key and its astounding colony of Magnificent Frigatebirds. 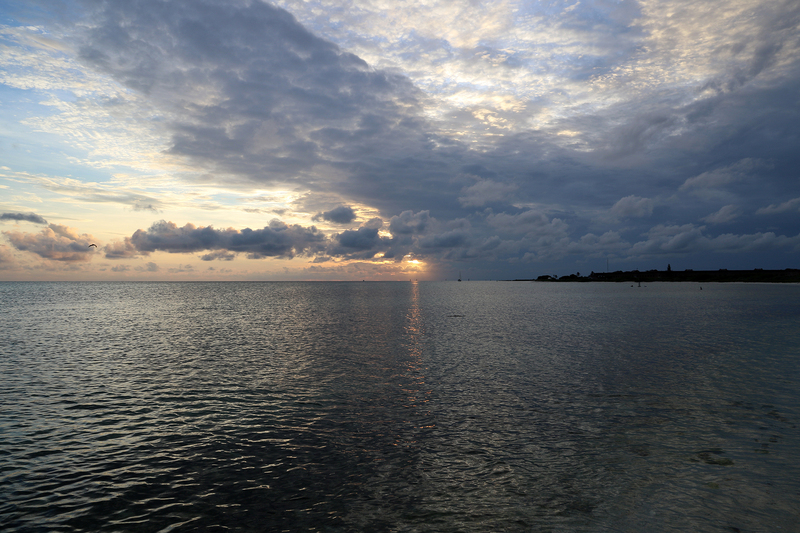 Long Key is 160 by 660 feet (86,000 square feet) and trends north/south from the eastern tip of Bush Key. 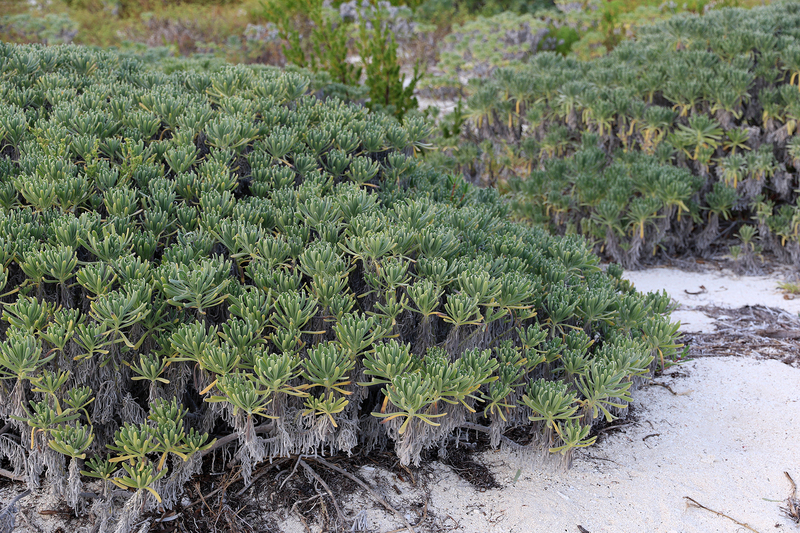 The vegetation is more robust on Long Key than on Bush or Garden Keys, with what could properly be called trees as opposed to scrub. 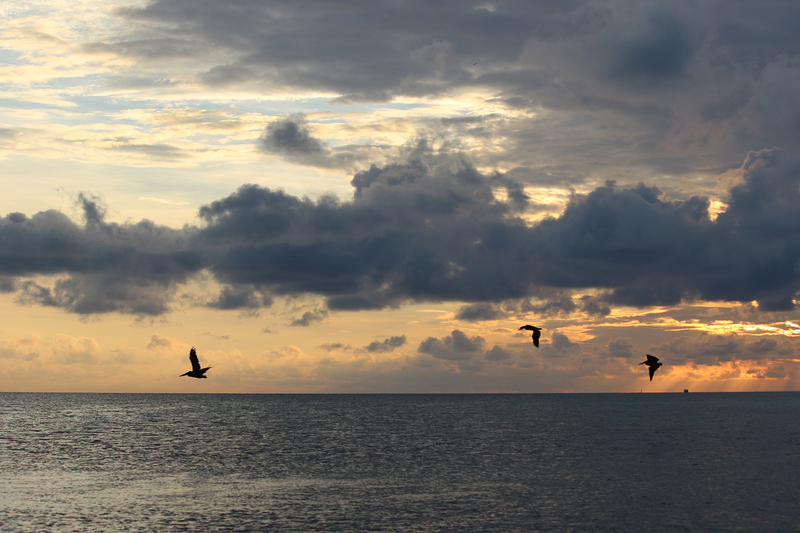 In the Atlantic, Magnificent Frigatebirds range from Buenos Aires to the Carolinas and in the Pacific from Equador to northern California, but the only breeding colony of Magnificent Frigatebirds in the United States is on Long Key. 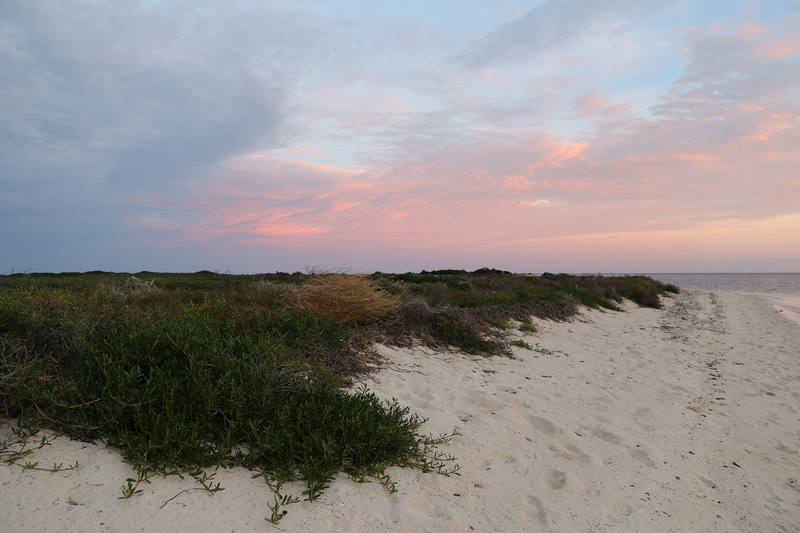 The island is off limits to visitors. 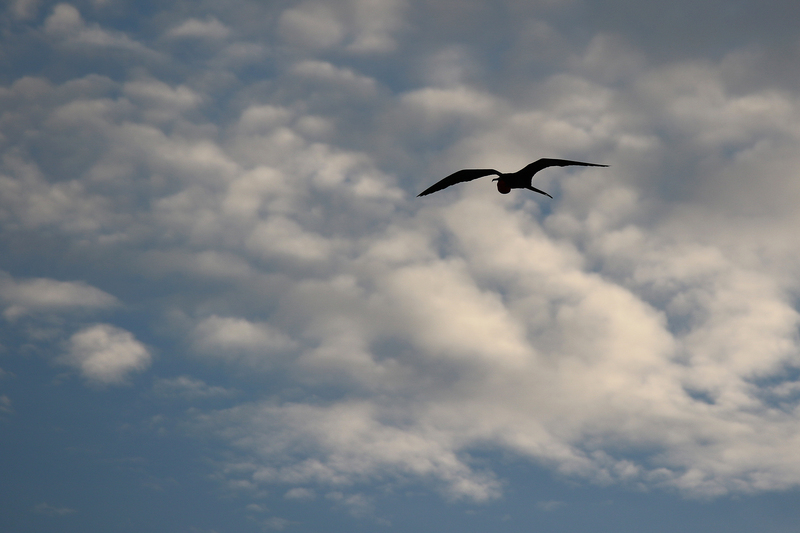 I had only ever seen one Magnificent Frigatebird before (from the ferry between St. Thomas and St. John in the U.S. Virgin Islands). 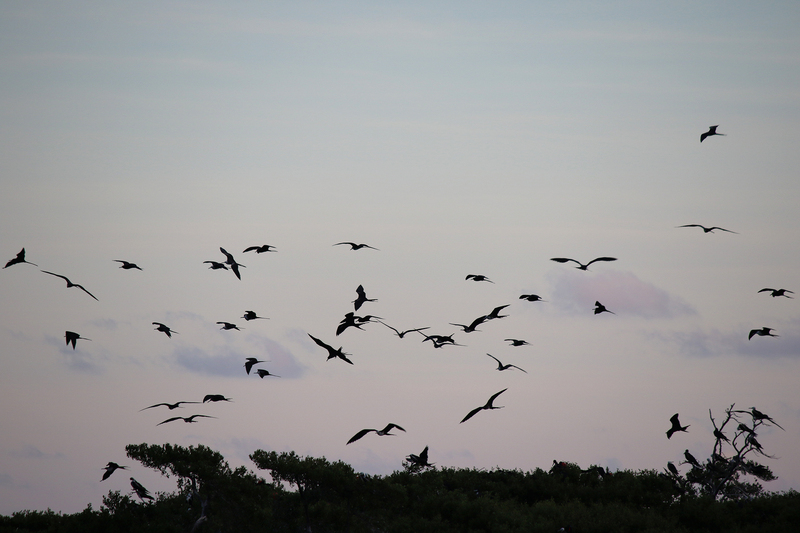 Now there were hundreds swirling around squawking and carrying on and soaring and landing in the trees. 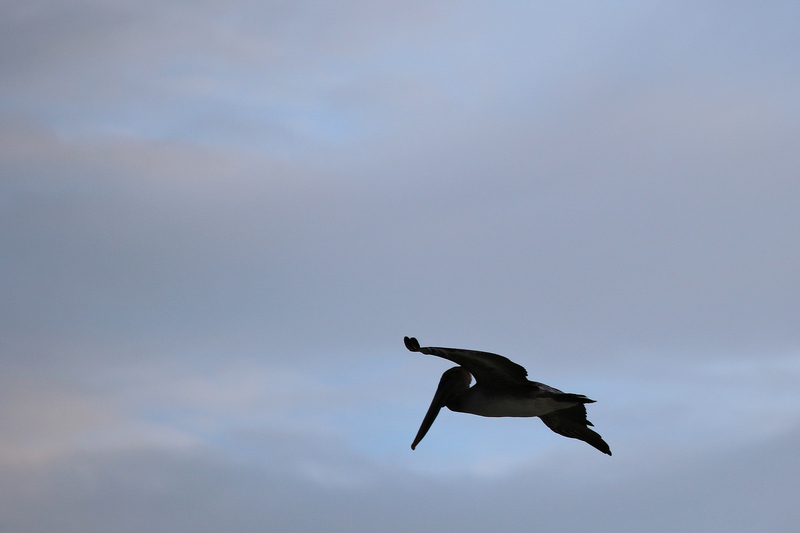 Meanwhile, two Brown Pelicans were just chill hanging out. 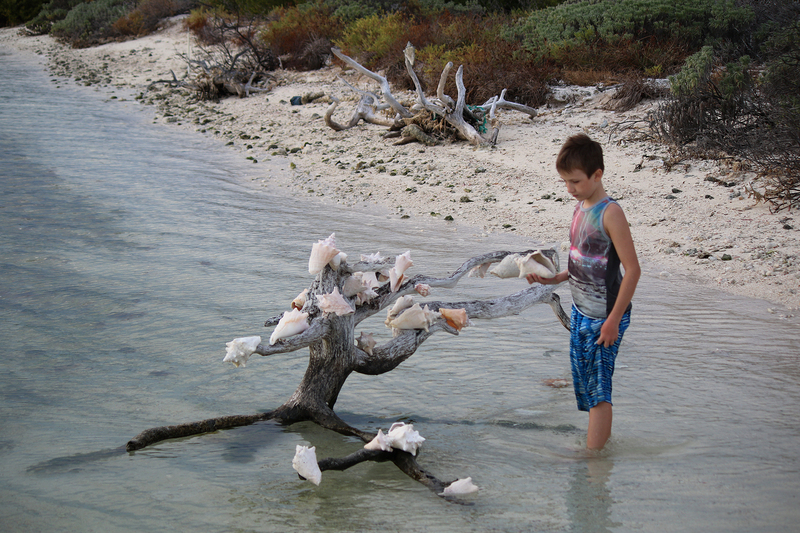 Ion added a few conches to those that other visitors had placed on some gnarled driftwood. 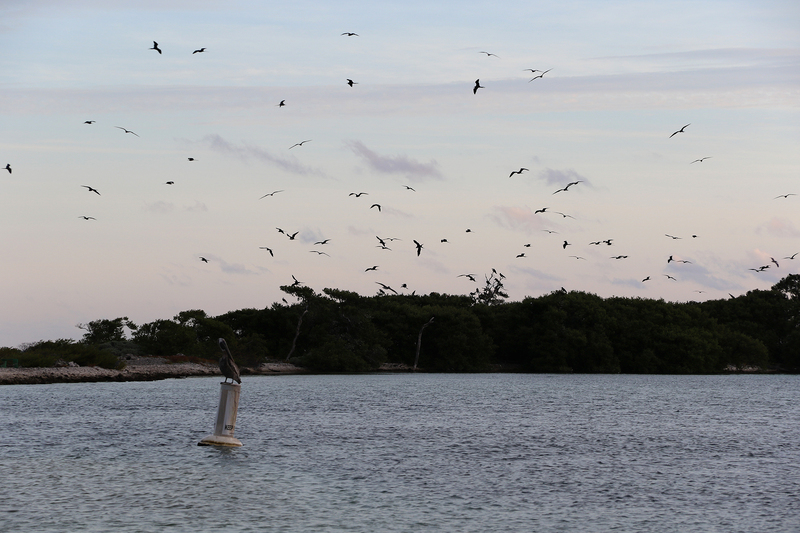 Out on Bush Key, surrounded by the Gulf of Mexico and these amazing birds, what had felt like space contracting as we arrived on a tiny island suddenly vanished and the Dry Tortugas felt expansive. This was not a place to hike and go and see that arch or this formation or that canyon as in other National Parks. 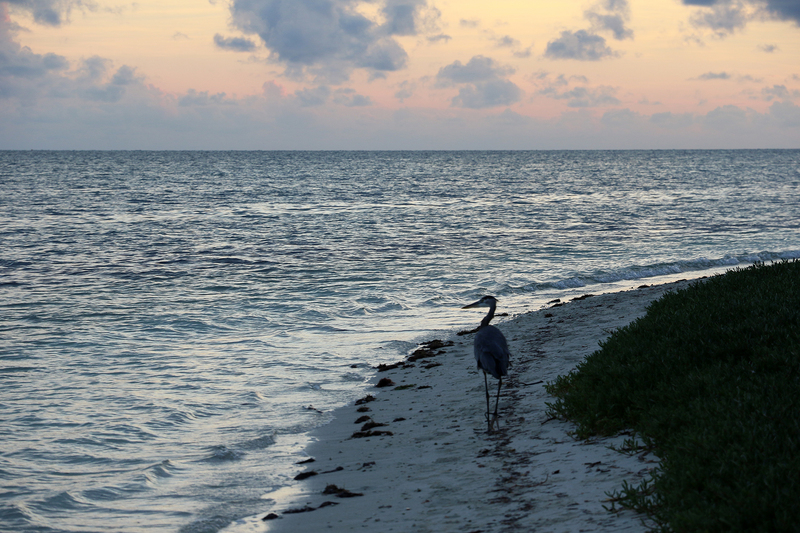 This was a Park, set at the convergence of North America, Central America, South America, and the Caribbean, where it was possible to feel at home and in a specific place in the hemisphere. 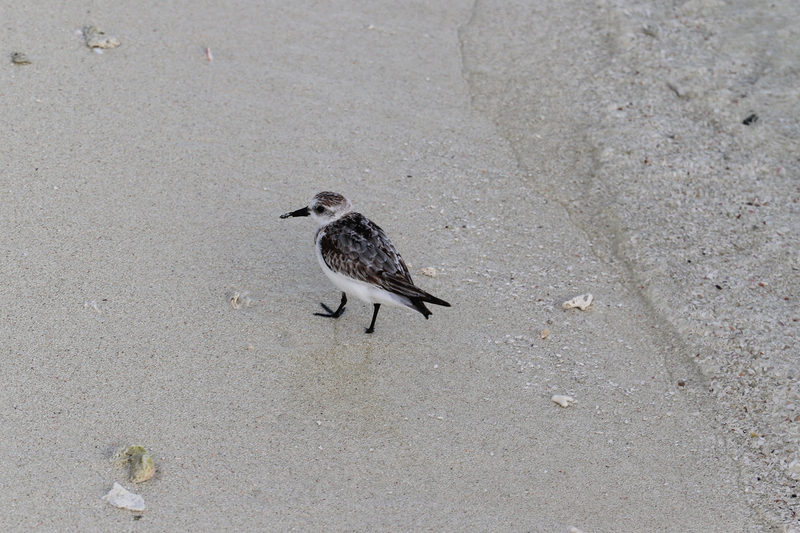 The little Sanderling at my feet may well have just come from the northern edge of Alaska. 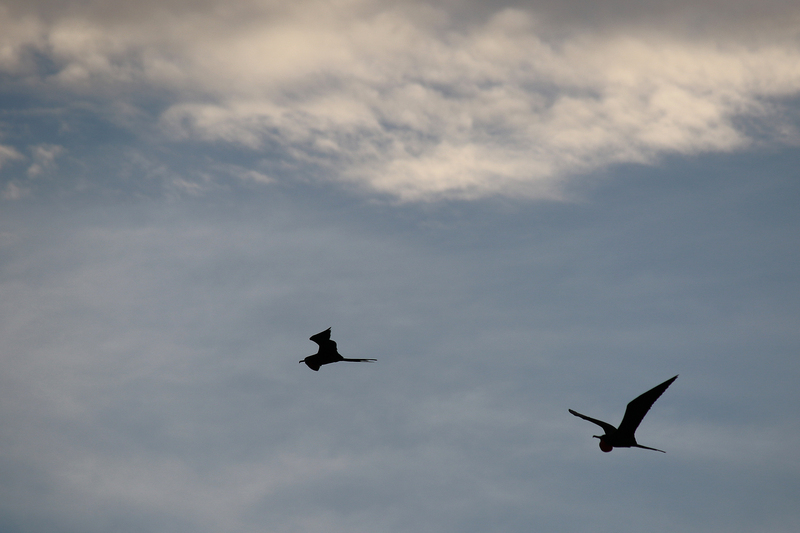 That Magnificent Frigatebird may head off soon to the coast of Argentina. 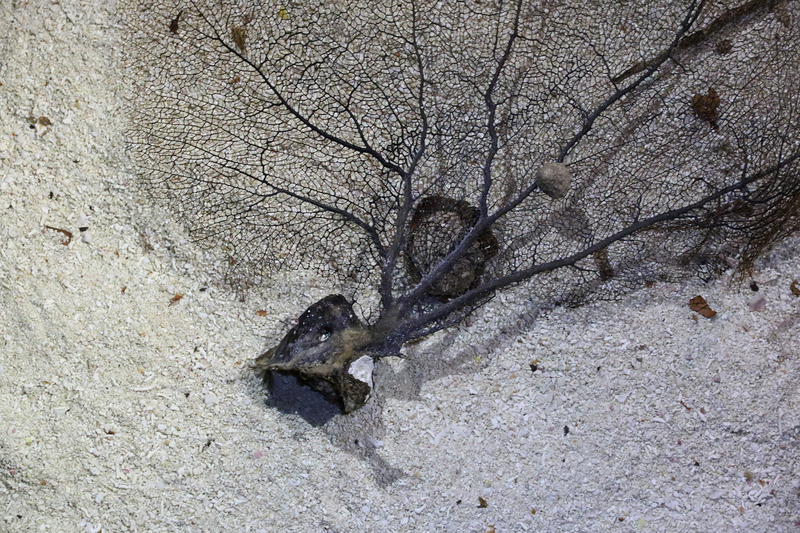 The sea turtles for which the islands are named swim thousands of miles across the ocean. But this little set of islands is a convergence for them and for us within an expansive world. 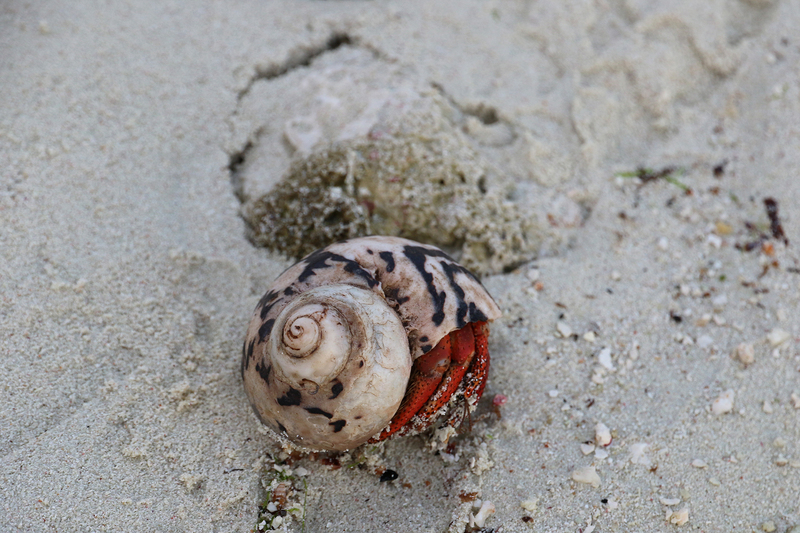 As we headed back we noticed more crabs going about their evening business. 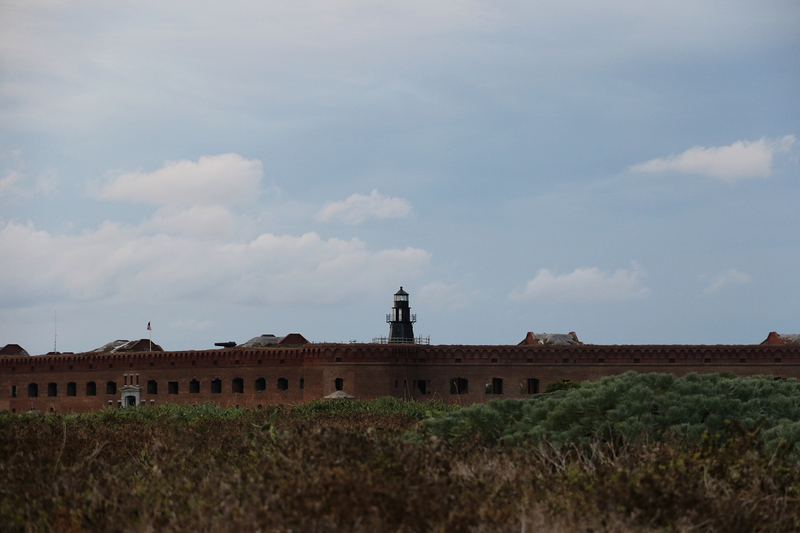 As cut off as we felt, our experience was, of course, nothing compared to that of the soldiers, civilians, and prisoners obliged to live at Dry Tortugas in the nineteenth century. 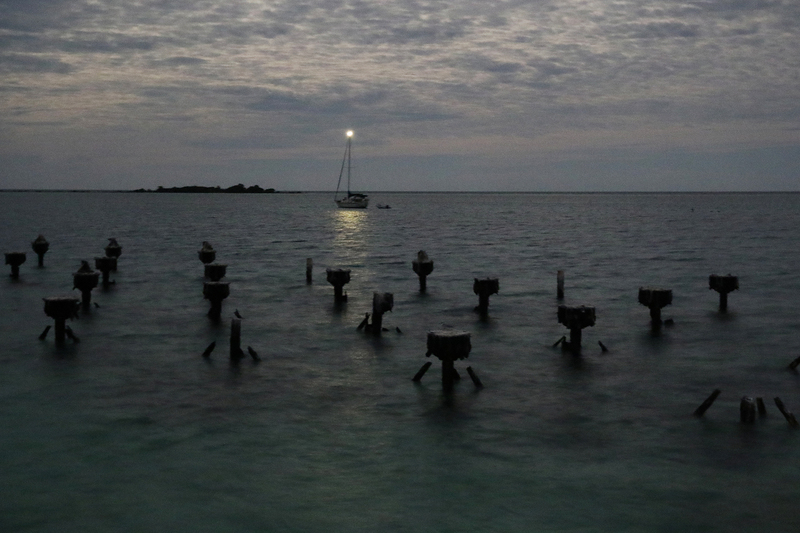 Then, these islands really were the ends of the earth and profoundly isolated. 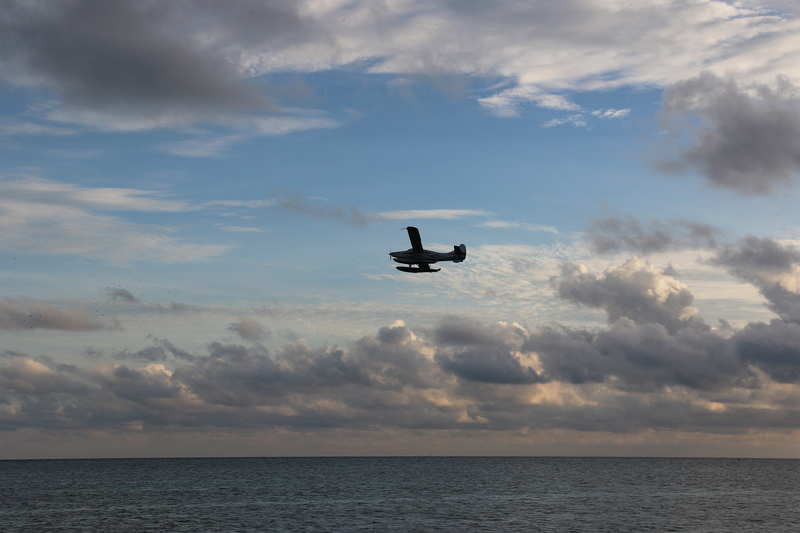 Now, there is daily ferry service and access by seaplane. 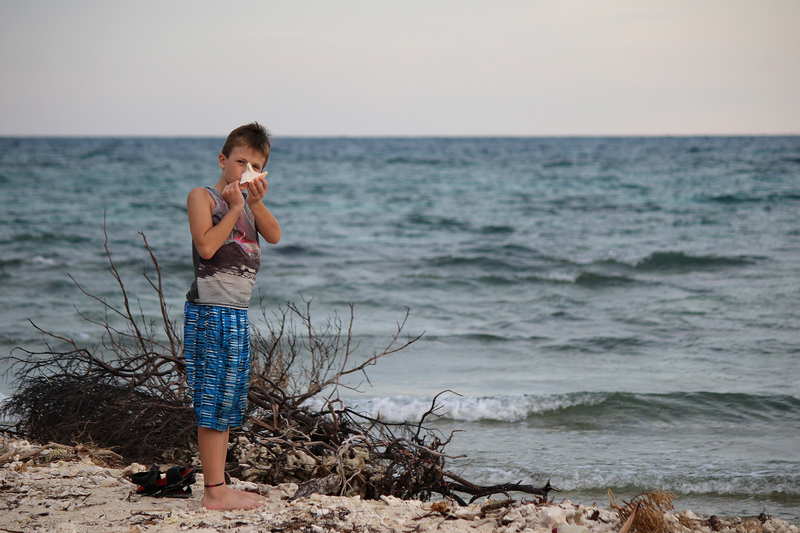 In our twenty-first century, rapidly expanding world we are more like the Sanderlings or Magnificent Frigatebirds, easily able to come and go even from a place as remote at the Dry Tortugas. 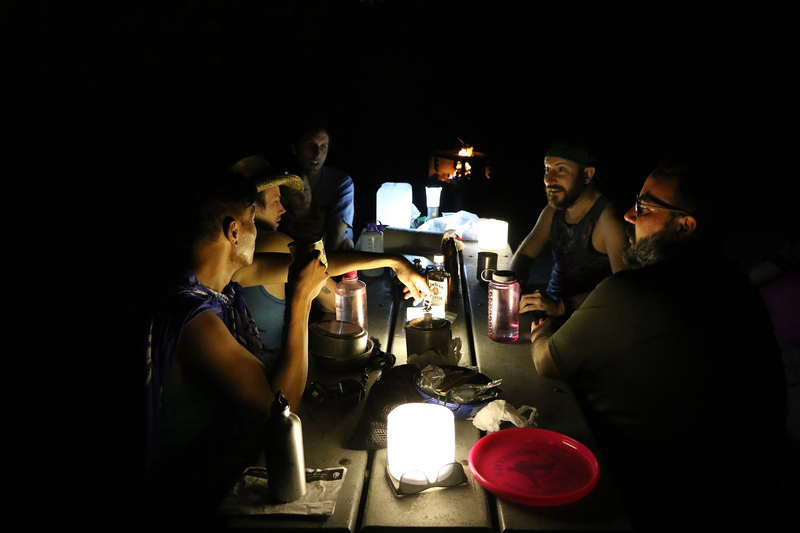 That night in camp we grilled both regular and meatless hotdogs, ate chips, drank wine, and enjoyed each other’s company. It was a regular family dinner around the picnic table. We were also very silly. 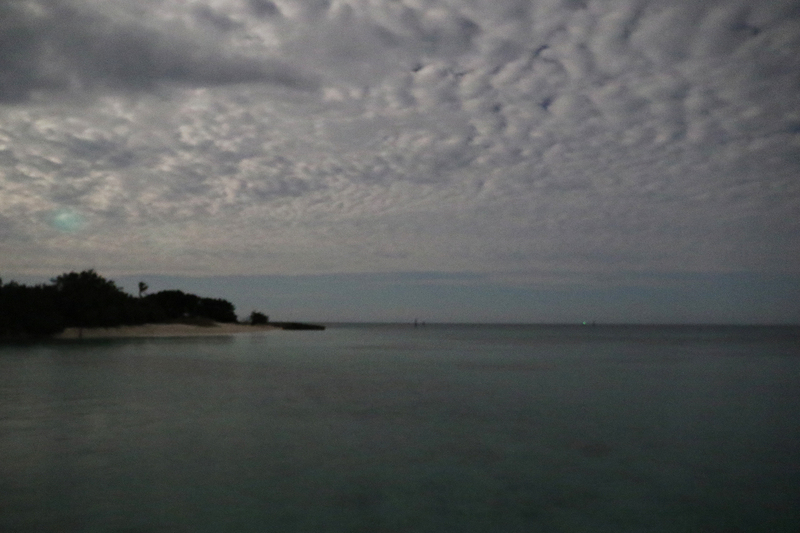 Wrapped in my sarong, I was dubbed King of the Island, later Grand Poobah of the Island. 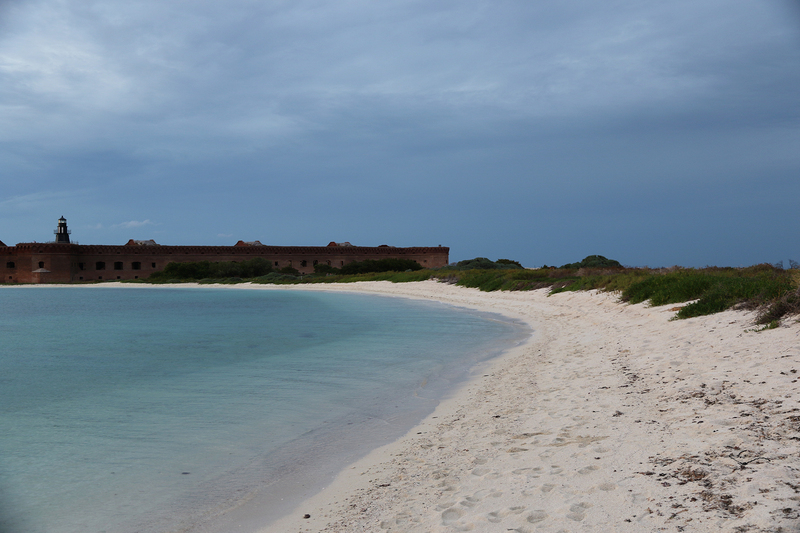 It had been a very long first day at Dry Tortugas National Park, but we weren’t yet ready for it to end. 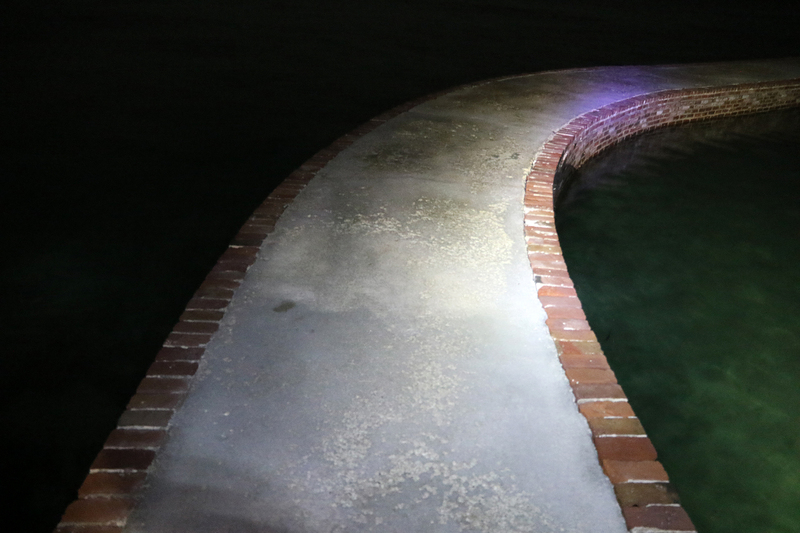 After dinner, we took a night walk around the moat, which was moody and spectacular. 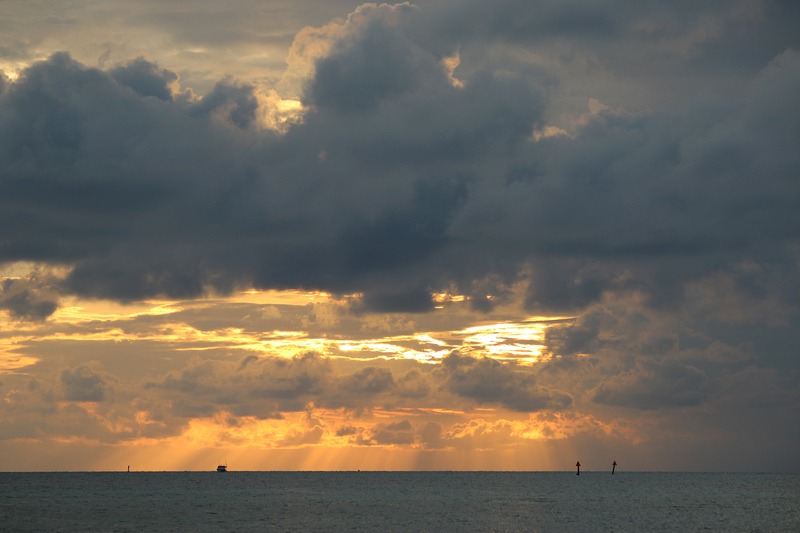 I managed to get a few photos that approximated the way it felt. 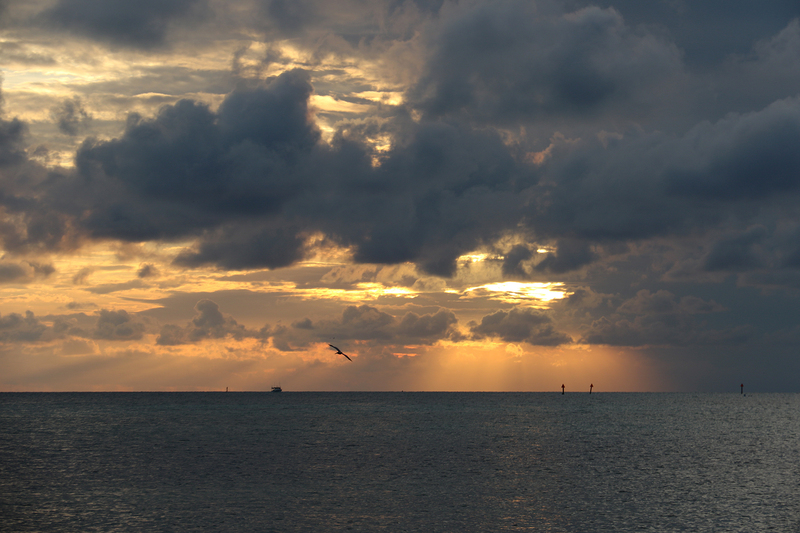 Although it was fairly overcast by this point, there was still a fair amount of ambient light. 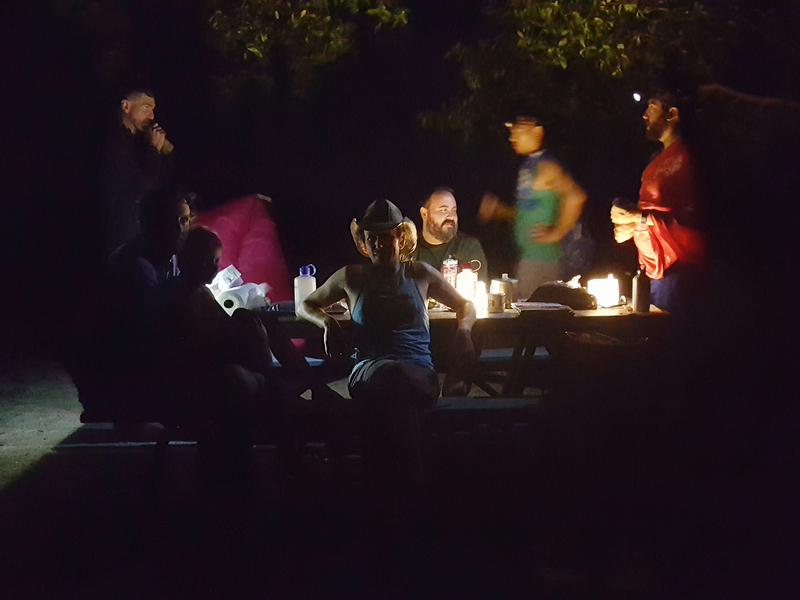 Nevertheless we were not stupid, and used headlamps and flashlights to light our way. 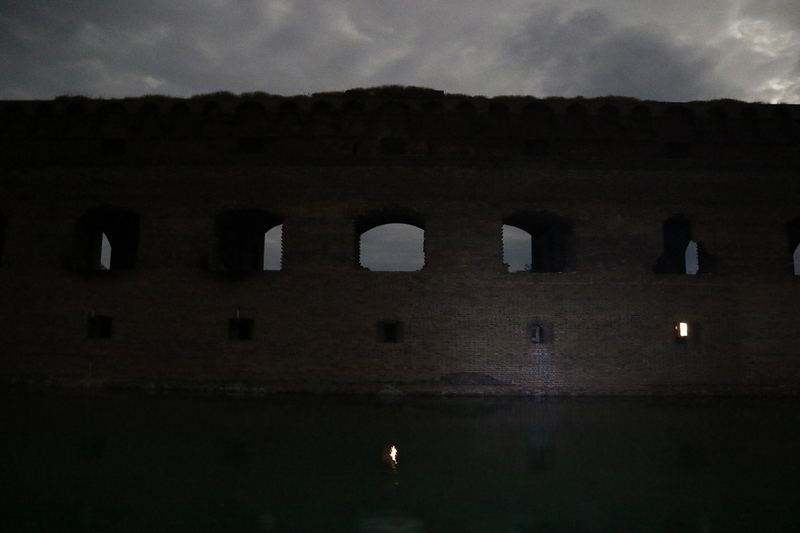 The waters of the moat were alive with nocturnal sea life including a squid and some other faintly bioluminescent creatures. 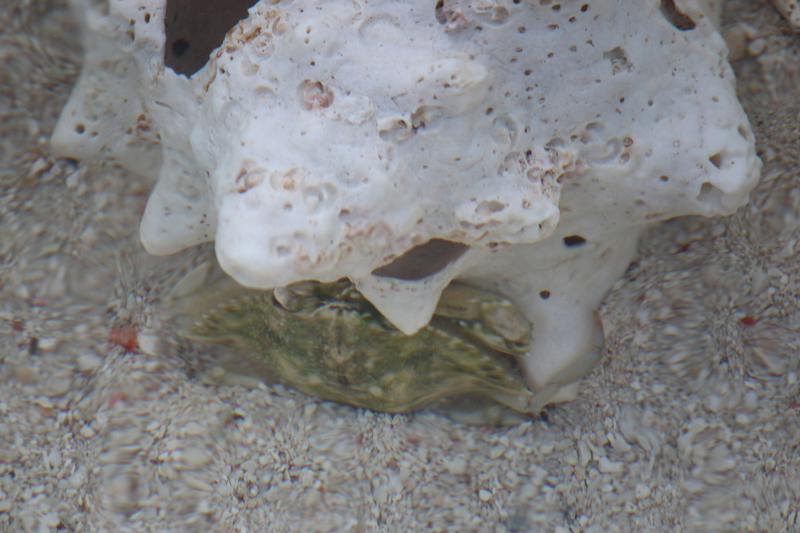 The best photo I got of any of them was of the squid, above. They will just have to live in our memories. I never did ask a ranger the story of the boat above. 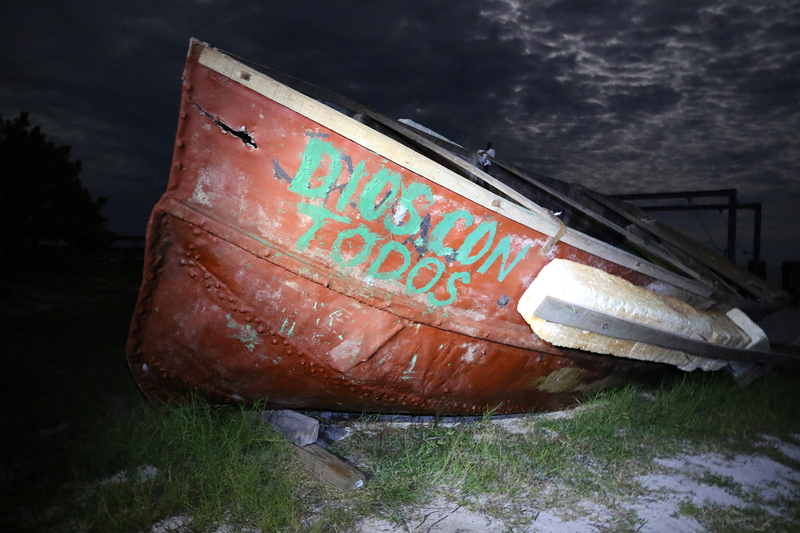 I’m thinking that it was a boat used by Cuban refugees? After our walk as a group, we all sort of split up a bit. 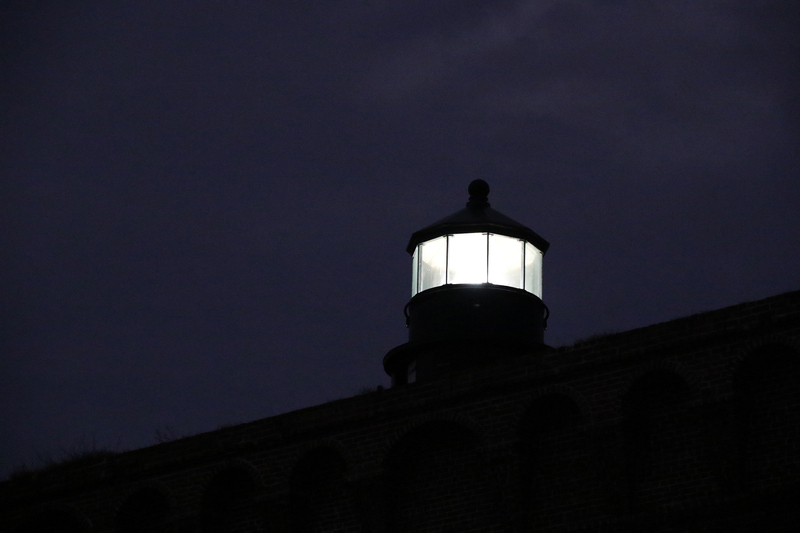 Kam and Adam sat on the helipad overlooking the south coaling dock. Noah curled up in his inflatable. Juan and Nick hung out in their tents. 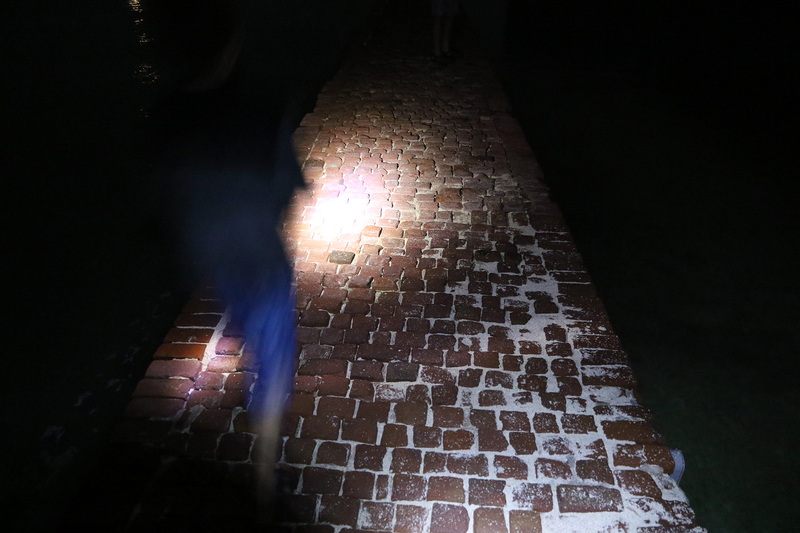 Sean and I did another loop around the moat, this time without flashlights, although we had them with us. 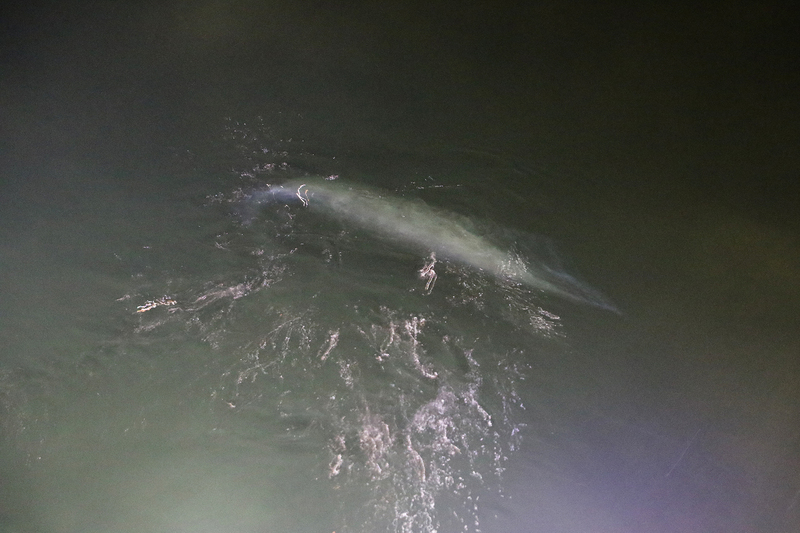 When we got back, Adam and Kam reported seeing more bioluminescence in the water, but it had faded away. Juan and Nick and Sean and I waded out into the water at the swimming beach. Another couple of campers not in our group were hanging out on the beach too. 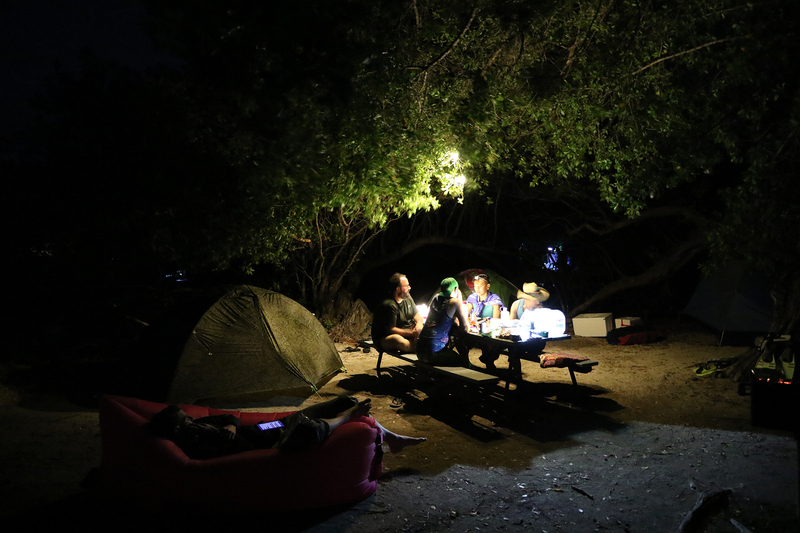 Everyone was quiet, even though it wasn’t yet remotely the official quiet time in the campground. 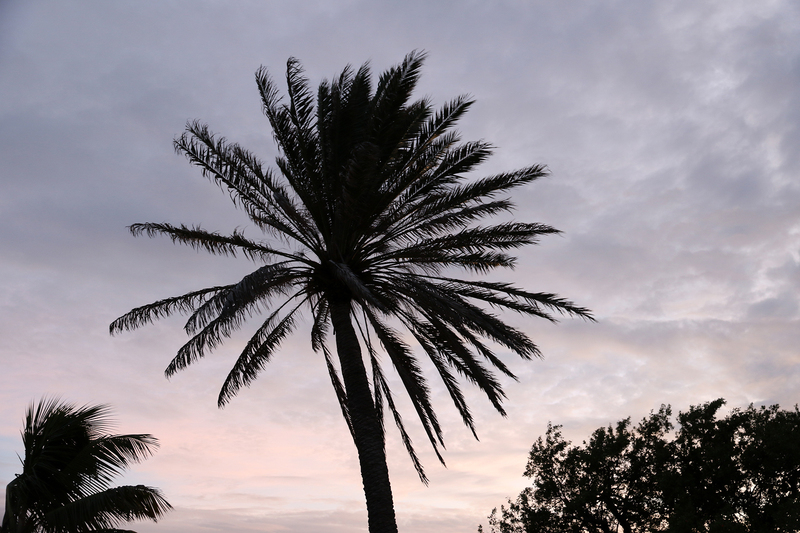 It was great to just take in the cool breeze and the smells and the dim light, getting the feel of the island at another time of day. As we began settling in, I was still antsy and ended up walking the moat twice more by myself, just to solidify the feeling in my memories. 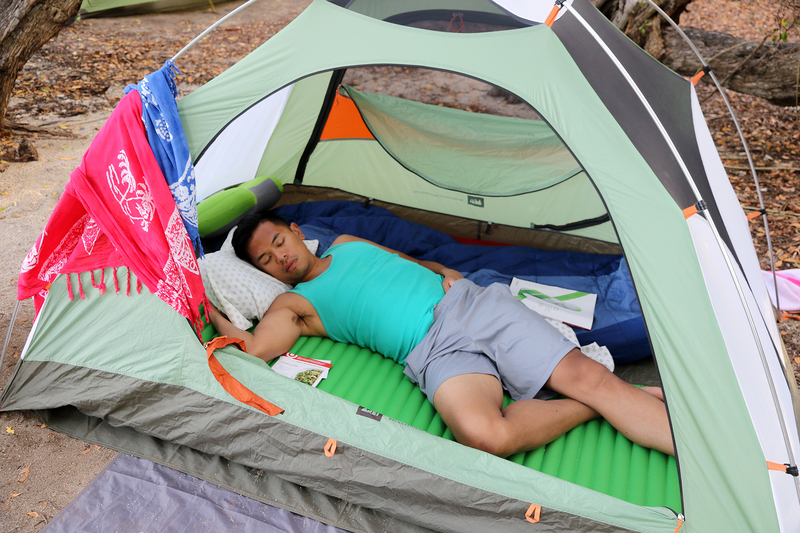 At one point, Noah vanished, and Sean and I eventually found him sound asleep on the swimming beach on his inflatable. Good night, Noah. The others had turned in too, and then so did Sean and I, but not after I’d walked once more around the moat. 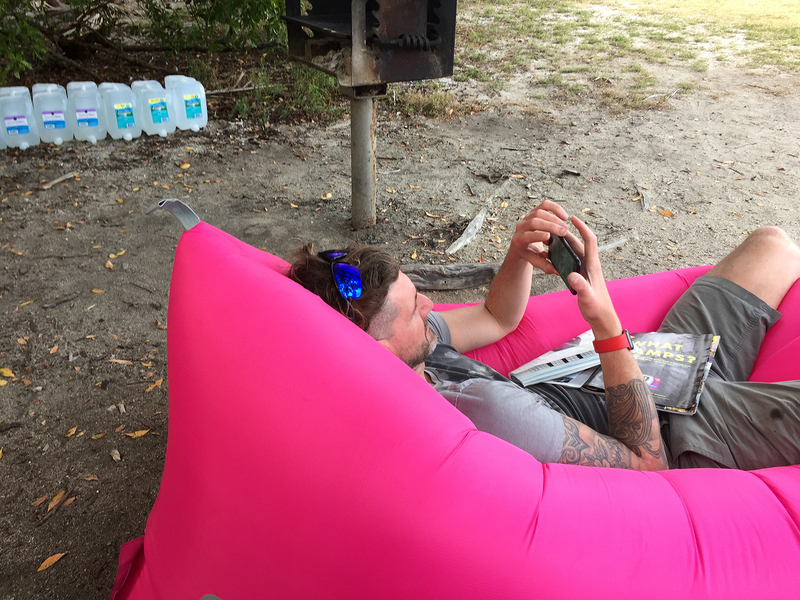 This entry was posted in Journey and tagged Camping, Day Hike, Dry Tortugas, Florida, Florida Keys on September 25, 2017 by Brandon Hayes.